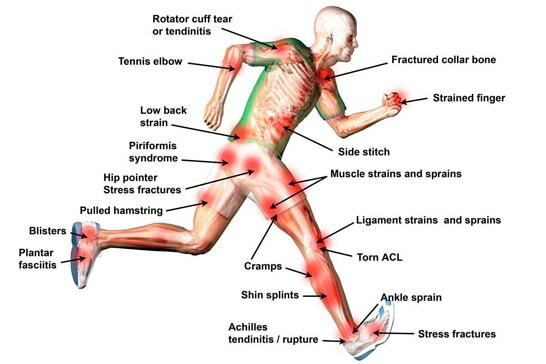 Sports injuries refer to a broad category of injuries in various parts of the body, which can be caused due to strenuous activities, such as sports. There are certain parts of the body that are more prone to damage from sports injuries. Below are the top 8 most common types of sports injuries. The top three categories (Runner’s Knee, Shoulder Injury, and Ankle Sprain) comprise more than 80% of all sports injuries. Runner’s knee is the most common type of sports injury. The problem happens most commonly to runners, cyclists, swimmers, as well as people who practice aerobics, play football, basketball, and volleyball. Overuse of the knee leads to irritation of the tendon below the knee-cap which results in this problem. Knee injuries can be the result of getting hit on the knee, falling down, or landing on a flexed knee. These are most common to footballers. These typically involve the ligaments that hold two of the bones of the knee – the anterior cruciate ligament (ACL), the medial cruciate ligament (MCL), or the posterior cruciate ligament (PCL). These injuries occur mostly during tennis, swimming, and volleyball. The chief cause of these problems is the overuse of the shoulder, which loosens the rotator cuff (a group of tendons and muscles around the shoulder). Ankle sprains are common to any activity that involves jumping, running or turning quickly (e.g., playing football, basketball etc). Such motion can lead to twisting of the ankle and possible tearing of a tendon/ligament. Tennis Elbow involves tendon degeneration in the elbow due to repeated backhand strokes common to tennis. This condition leads to pain on the outside of the elbow. Golfers Elbow impacts the inside of the elbow, due to the inflammation of the muscles responsible for forearm-flexing. who start working out and increase their intensity too fast. This refers to a strain the adductor muscles, situated in the upper thigh which help to pull the legs together and causes sharp pain and swelling on the inside of the thigh. This usually happens when one changes directions suddenly while running. The hamstrings are the muscles behind your thighs. Hamstring strains most commonly occur due to inadequate warming up or excessive fatigue.